to make or save civilization. The Burmese election November 7: boycott or engage? 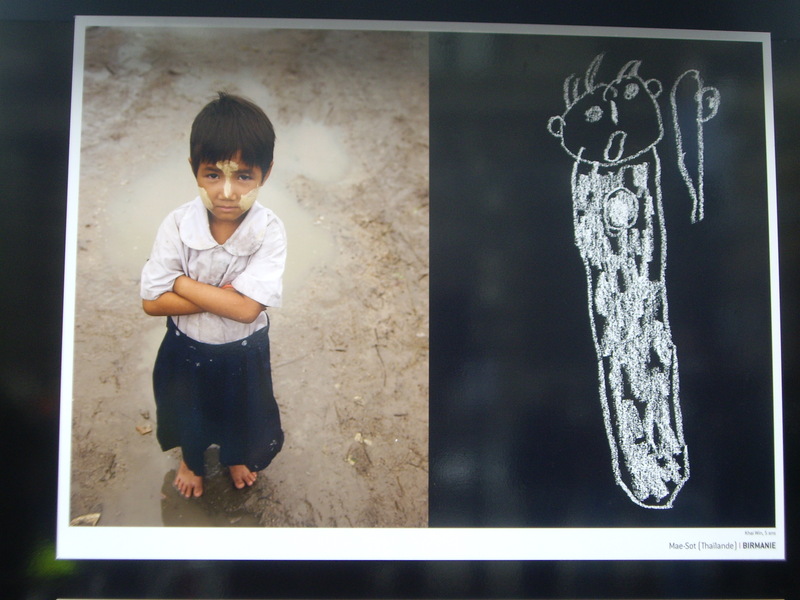 The above image was taken by the author at an open-air exhibition in Paris, Nov. 2009, of children’s self-portraiture from around the world. Unique among hundreds of images, this portrait shows itself fully cocooned, with eyes closed, mouth wide open as if in an endless silent scream. A faceless figure, or perhaps weapon, confronts the terrified figure. The photograph of the artist, a 5 yr-old Burmese girl living in a refugee settlement on the Thai border, shows her arms crossed, gazing distrustfully at the photographer. This also appeared to be unique among the literally hundreds of portraits on exhibit, which generally showed children smiling, dancing, moving in free space. In the lead up to Burma’s first election in twenty years – in any form, let alone a properly democratic one – it might be useful to provide a general summary of the often complicated political landscape of the country. I use the country title of Burma rather than Myanmar to draw attention to the latter name having been imposed in 1989 by the military dicatatorship of General Ne Win (now deceased), its use by the international community only tending to legitimize an authority that has never either deserved, or legally warranted, such legitimization. Burma as a title is problematic also as it refers more generally (as the derivation ‘Myanmar’ itself does) to the ethnic majority Burmese (or Bamar) people whom the ruling junta seek to make an absolute power – hence their policy of effective genocide against non-Burmese (so-called minority) peoples in the Karen, Mon and Shan states, as elsewhere. 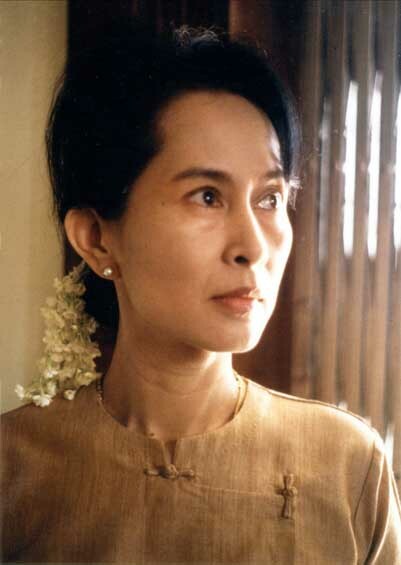 Yet ‘Burma’ is perhaps preferable to ‘Myanmar’ in its greater historical context which includes the founding of the nation as a modern state in the post-war period, under the inspiring, yet short-lived leadership of General (or Bogyoke) Aung San – Aung San Suu Kyi’s revered father, loved by democrats and conservatives alike within Burma. He was assassinated in 1947, at 32 years, just months before the independence of his country was achieved from the British Empire, killed by a haze of bullets that struck down many members of his party in an attack by political rivals. Burma’s freedom has been compromised by internecine antipathy from its beginnings. The essential problem facing the democracy movement now both within and outside Burma is whether to engage with the electoral process at all, or if so, to what degree and with what kinds of reservations? Does to engage render any equally vital critique morally futile? Or is some form of engagement the only way to initiate or continue whatever existing level of dialogue currently exists with the regime of Senior General Than Shwe (himself lately de-commissioned as a general in order to play a civil-political role from hereon)? This is a difficult question as there are compelling ethical and politically pragmatic arguments informing both views. The Burmese electoral process has been designed according to the terms of the 2008 electoral commission to entrench the military authority of the (aptly-named!) State Peace and Development Council (SPDC) in the guise of a civil government. The 2008 constitution (bitterly opposed by many in the democracy movement) effectively disallows essential aspects of open electoral candidature: freedom of expression, peaceful assembly and association. Given the restrictions of time for registration, limitations of assembly, the excessive costs demanded of non-junta parties and the latter’s easy access to state funding, the results of the election can effectively be seen as a fait accompli. Pro-democracy actions are regularly disrupted and persecuted across the country, a number of parties have been kept from registration, individual candidates arrested or otherwise banned from competition, Aung San Suu Kyi herself still held under house-arrest despite repeated global calls for her release. By the terms of constitutional rulings she is disallowed from standing as a candidate because of her having been married to a non-Burmese (her late husband was British). Her status as a political prisoner has however been qualified insofar as she is now apparently able to vote, if not stand herself, only because she is formally under house-arrest rather than criminal conviction. These kinds of Orwellian double-speak can clearly be seen to operate as some of the quasi-legalistic means by which the regime maintains power, and tries to seduce international scrutiny to a passive acceptance of their manouvres. The power of faux-legal rhetoric, as spurious as it in reality is, nevertheless carries the false authority that itself allows for the intransigence of the regime to be accepted by the technocratic structures of international governance. In the meantime the junta is certain to gain a 25% military representation alone in the parliament, as guaranteed by the 2008 constitution. The remaining majority of the vote will almost certainly go to the junta-backed Union Solidarity and Development Party (USDP) and related pro-junta parties such as the National Unity Party (NUP), led by former military chiefs of staff. Between them these proxy-junta parties will field about 2,000 candidates out of a total 2,500 to contest the 1,163 seats in the three levels of legislature formed by the 2008 constitution. Further complicating the weakness of pro-democracy representation within Burma is the division that has come about from the dissolution of the National League for Democracy (NLD) party led by Aung San Suu Kyi. For the NLD to contest the election, Suu Kyi would be required to stand down as its leader which would itself defeat the purposes of the party’s resistance to the junta – perhaps largely symbolic, yet still powerful . Hence the NLD has been disbanded as a political party in view of maintaining its integrity. It seeks instead to exert influence and benefit for the people in social service work on the ground. However, a faction within the NLD still hoping to contest the election as at least more proactive than general non-participation through boycott would be, has formed an autonomous party, the National Democratic Force (NDF) which in accepting the unjust terms of the election and constitution, sends an ambiguous message both to the people of Burma as well as the international community.This ambiguity thus characterizes both the election itself, the engagement of the democracy movement within Burma, and the attitude of the international community. There is a perception that humanitarian space and elections are naturally inclusive terms, post-election, and that with greater humanitarian operating freedom will also come greater political freedoms. Hence the U.S., for example, seeks to engage the regime (clearly on economic and trade-based goals and investments) as well maintain a clearly-voiced denunciation of human rights abuses within Burma. The junta is both legitimized in its greater potential inclusivity in the global-economic program, while its moral status as a regional stakeholder takes generally second place to this hope, clearly alive on both sides. In July and September of this year Senior General Than Shwe was able to visit India and China, respectively, under a general show of respect and impunity. Surely we can and must join Win Tin in his call for action, as belated as that action may already be, and as direly urgent as the call itself has for so much longer already been.